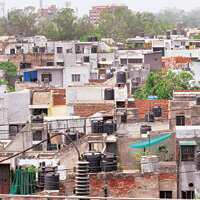 Housing concerns: Delhi Development Authority houses in Janakpuri, New Delhi. The agency acquires land for the development of New Delhi and builds low-income houses. New Delhi: The urban development ministry is looking at expanding the scope of a proposed real estate regulator for New Delhi to include the regulation of government- linked agencies such as the Delhi Development Authority (DDA) and Municipal Corporation of Delhi (MCD), besides private realty developers and agents, in a bid to make all urban bodies more accountable. “We are looking at a proposal where the authority will check unfair practices by not just developers, but also other bodies such as DDA and MCD," an official in the urban development ministry said. “This is a proposal made by the Delhi government, which felt regulation should not be restricted just to developers and should include all the players." The Union government is hoping that Delhi’s Real Estate Management Bill will be adopted as a model by other states, which want to better regulate real estate projects and transactions. While DDA, the de-facto landlord, acquires land for the development of New Delhi and builds low-income houses, MCD provides civic services to the city such as garbage collection and road maintenance and clamping down on illegal buildings. “DDA is right now not accountable to anyone," Arvind Parekh, chief financial officer, Omaxe Ltd, said. “They take a lot of time to give approvals and they are responsible for many delays in projects. A regulator for DDA as well will add to the efficiency of the whole system." The draft for the proposal was kicked off earlier in the year, amid an overheating property market and three years of frenzied buying when real estate values tripled. The sudden escalation in prices created several millionaires among smaller property developers, and spawned a new class of selling agents and building contractors who turned to property development for quick gains. That, in turn, created irregular practices, which included decamping with buyer’s money, delayed projects and poor quality of developments. That prompted the ministry to set up a real estate regulator for New Delhi to check fraudulent practices. Under the Bill, the ministry has proposed setting up a regulator to check developers and agents. The proposed Bill will also provide for punitive action against the developers and cancellation of licence of builders if they are found to be flouting the norms set by the Bill. However, the ministry isn’t yet sure whether it will take similar stringent punitive action against government bodies and said the matter is under discussion. “We are rethinking the role of the real estate regulator," the ministry official said. “We are not sure if we should have punitive action against the bodies as some of them, such as MCD, already have their own mechanism to address consumer complaints," the official said. The proposed regulator would be a quasi-judicial body and consist of former bureaucrats. However, the ministry is also concerned that when the urban local bodies are brought under the purview of the regulator, it will increase the burden of the regulator. “Cases will pile up before the regulator if local bodies are included," the official added.